One of the most beautiful glens in the whole of Scotland, this stunning and dramatic gorge tears its way west into Scotland’s stunning scenery. The glen spans for some 30 miles from nearby Cannich to Kintail in the west, it boasts scenery that has attracted photographers and artists from all over the world, and the very famous painting ‘Monarch of the Glen’ was painted in Glen Affric by landseer, and is an icon image of Scotland to this day. The glen is a Caledonian Forest Reserve and is one of the few places you can see Scotch Pine today, in 2001 Glen Affric was given the award of a National Nature Reserve, and helps preserve some of Scotland wildlife and nature including Scotland’s wild flowers, mammals and birds. Glen Affric is an excellent place for the adventurous and active amongst us and attracts walkers and cyclist from all over the world that follow the various tracks and paths winding their way through the glen, the river and loch also provide plenty of action for those who love to fish with plenty of Salmon and Trout passing through the glen every year. But if you prefer to just relax and wind down the glen is the perfect way to experience a Scottish holiday. One of the best times to visit the glen is the autumn when the whole forest changes to stunning colours, with the beautiful purple heather backdrop at this time of year the vista is one of awe and wonder, with Scotland’s nature at its best, however anytime of the year is great for this glen and the ever changing weather and seasonal wildlife makes this one of Scotland’s great glens and worth a visit when on holiday in Scotland. Winding its way through the foothills of Britain’s highest mountain Ben Nevis this glen is more accessible than most people think, only a short distance from Fort William the glen boasts an excellent road to take you into some of Scotland stunning scenery, when the road comes to an end you are left with some great trails to take you into true Scottish wilderness, at times is hard to think that you just left your car down the road. One of the best paths for those who don’t want to tackle some of Scotland’s Munros is the path to Steall Falls, following the path through the gorge you are rewarded with excellent views of the falls as they roar and tumble down various sections of the cliffs bouncing through rock pools and cascading down the mountainside, It’s a great place to get some excellent pictures of your holiday in Scotland to take home and show your friends. This Glen is an ideal location to have a great holiday in the Scottish Highlands, with a great campsite set within the glen with Fort William very close by for excellent hotels and amenities. This Glen also marks the end of the famous and very popular walk ‘The West Highland Way’ a 95 mile walk, and is a special place to end such a demanding and long trek. When you ask anyone about Scotland and its astounding beauty the words Glencoe is often the first thing people will mention, the A82 slices its way through the heart of the Glen and gives everyone a chance to see this iconic view from the car without ever stepping foot onto the Glen. But this is a real shame and anyone planning to have a holiday in Scotland should stop and take a good look around as there are many things to do and see in Glencoe and should not be missed. The Glen is full of secrets and charm that anyone with an exploring mind will find exciting and enthralling. 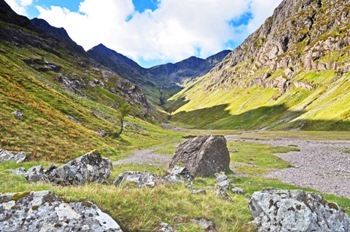 History in the Glen is most famous for the massacre of Glencoe and many people will venture into the glen to discover the true feel and unchanged image of the Glen, a short walk through the Glen is Signal Rock the place where the signal was given at the start of the massacre. But the Glen is host to some of the greatest climbs and walks in the whole of Scotland, with such well known mountains of Bidean nam Bian, Stob Coire Sgreamhach and Aonach Eagach Glencoe is a massive attraction to climbers and walkers of these great mountains. The village of Glencoe is also nearby the valley and provides you with excellent amenities to keep you well stocked up for your daily adventures, Fort William is also a short distance away, at the South of the Glen you have Rannoch Moor to explore and to the North you have beautiful lochs like Loch Linnhe and Loch Leven, all providing excellent water sports and lovely drives and places of outstanding beauty. So remember next time you are on your way up North passing through the Glen on the A82, there is more to see around the Glen than you can from your car window, get out and explore. Often passed by and ignored by tourist excited about driving through Glencoe, this Glen guarded by the two great Mountains Buachaille Etive Mor and Buachaille Etive Beag also known as the Heardsmen of Etive, is situated just before Glencoe comes into view travelling North, the left turn just passed the Kings House Hotel, is probably one of the best left turns you could ever take. The Glen stretches by road 14 miles till you come to an abrupt end at Loch Etive, the road however is worth every bit of tarmac, and the best thing about it is, you have to drive back and see it all again, this Glen is just truly magnificent, you see a bit of everything along this drive from stunning mountains, forest, rivers, waterfalls and wildlife, this Glen as it all. The glen is very popular with walkers and climbers as well as Kayakers braving the fast white water rapids that the River Etive throws at them, it is an excellent place to just stop and look with plenty of passing places on the road to stop and take in all the views, it is also a much quieter road with not as much traffic of its neighbour Glencoe. Driving down the first section of the glen you are treated to open moorland and massive mountain passes, meandering by rivers and stone bridges, with waterfalls teasing you from all directions, further down the glen you are welcomed by green forest before you reach the end at Loch Etive, here you can stop and think back of what you just seen, ready for the journey back along the same road but with different views, and just as stunning till you return to the busy A82, the road to Glencoe. This Glen deserves more credit than most of its sister glens, mainly known by the most dedicated tourist of Scotland but fairly unknown by the major stream of tourist companies and buses, maybe we should just keep it this way?